The seventh cranial nerve is the facial nerve. This nerve is both a sensory and motor nerve. The facial nerve originates from the pons and innervates the motor function of the muscles of facial expression. The facial nerve also innervates two small muscles known as the stapedius muscle and the posterior belly of the digastric muscle.The stapedius muscle is the smallest skeletal muscle in the human body its function is to stabilize the smallest bone of the body the stapes. The stapes bone is a small bone found in the middle ear. The posterior belly of the digastric muscle acts to elevate the hyoid bone, a small u-shaped bone found at the base of the mandible. The facial nerve also receives taste sensory information from the anterior 2/3rds of the tongue. The facial nerve also innervates several glands including the lacriminal gland and all of the salivary glands with the exception of the parotid gland. Motor impulses of the tear glands are also carried by the facial nerve. Parasympathetic fibers of the head and neck ganglia are also supplied by the facial nerve. The function of the facial nerve can be tested by showing your teeth, puffing up your cheeks, wrinkling your brow, frowning, pursing your lips, and closing your eyes tightly. Bell’s palsy is a weakness or paralysis of the muscles on one side of the face. 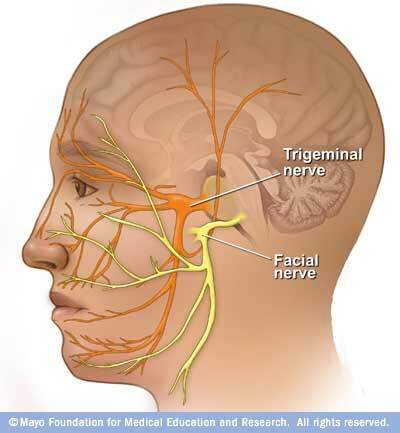 The facial nerve is often damaged by inflammation and causes one side of the face to droop. Other symptoms of Bell’s palsy may be pain in or behind the ear, drooling, excessive tearing or dry eyes, numbness on one side of the face, or increased sensitivity to sound. When a reason for the weakness or paralysis can not be determined it is called Bell’s Palsy, because many health conditions can cause facial paralysis or weakness. Most people affected by Bell’s palsy are able to recover within a couple of months without treatment. Corticosteroids and prednisone are given to the affected person in order to reduce inflammation if Bell’s palsy is thought to be caused by inflammation.